Before migrating your trading environment to support the Enhanced Order/Fill Delivery, identify all applications in the environment that need to be upgraded to support the new messaging system. For a complete list of TT products that support this enhancement, review Supported Applications. TT provides backwards compatibility allowing the user to upgrade each component in the trading environment without negatively impacting existing products. However, to obtain the full performance gains from this enhancement, all related products in your trading environment must be on a version that supports the new functionality. As you add applications that support the Enhanced Order/Fill Delivery, performance increases for the entire environment. 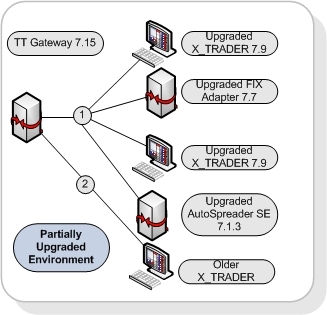 In this diagram, the older X_TRADER benefits from the reduced traffic provided by the upgraded applications. The following is a list of the minimum client application versions that support the Enhanced Order/Fill Delivery. To achieve optimal performance and reliability, TT recommends that you install the most current production releases. The Enhanced Order/Fill Delivery functionality is part of all TT Gateways Version 7.15 and higher.